Petros Peak is located in the northern section of the Lost River Range, not far from Willow Creek Summit. Splattski had eyed this one while climbing Dickey Peak a couple years prior. We’d kicked around the idea of doing Petros as a winterish ascent, and figured we could reach the summit if conditions were good. On this particular day, conditions weren’t expected to be that good, but we decided to give it a shot anyway. Splattski, Sean and I left Boise bright and early at 4am. It was a long drive, but time passed pretty quickly, and we made it to the vicinity of our peak by around 9am. After some discussion, we decided to try our approach from Gooseberry Creek Road. Unfortunately, there was a bit more snow coverage down on the flats than we would have liked. As a result, we would have to cover over 3 miles before reaching the base of the peak. 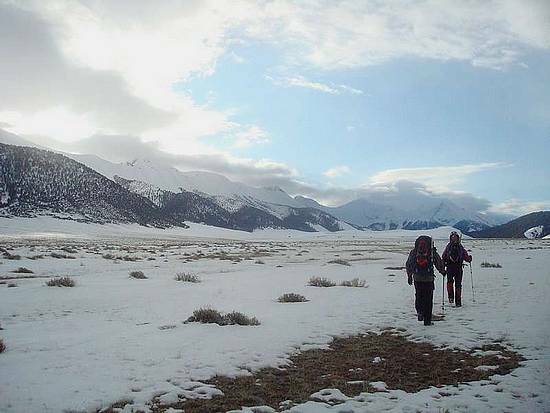 At that point, the weather was still holding, so we set off across the plain towards the ridge north of Arentson Gulch. It was a long hike, but we made pretty good time thanks to firm snow. Once at the base of the ridge, we donned snowshoes and started up through the trees. It was good to finally be gaining some elevation, but unfortunately we were climbing up into the weather through crusty snow that was slowing us down. As we got higher, visibility go lower and the wind was really picking up. Soon we were in blizzard like conditions, with less than 40 feet of visibility. The altimeter said 9800’ when we finally decided to turn around. The slope had gotten steeper, visibility was minimal, and the tracks we’d just made were quickly filling in with snow. We may have been able to continue, but getting back down would have been a problem. So down we went, disappointed but in all in agreement with the decision. Once back to the base of the mountain, the car looked a long way off. I thought we’d never get back to it. Map of our route, 10 miles round trip and 3300' elevation gain to our stopping point. The start of our long trek across the flats.